With Continua, I became interested in designing a sort of game that would allow me to choose colors from the spectrum according to a set of probabilities, thus eliminating the need for compositional logic and allowing colors to present themselves in endlessly variable relationships of quantity and quality. Within the game there are elements of chance and elements of probability. The size of each color section is chosen at random and can range in thickness from 95 pages to 950 pages. The colors themselves are chosen according to a set of probabilities that favor slow change or modulation, but allow for the occasional juxtaposition of more distant colors. This system results in unique and unpredictable compositions with in each column and throughout the space. 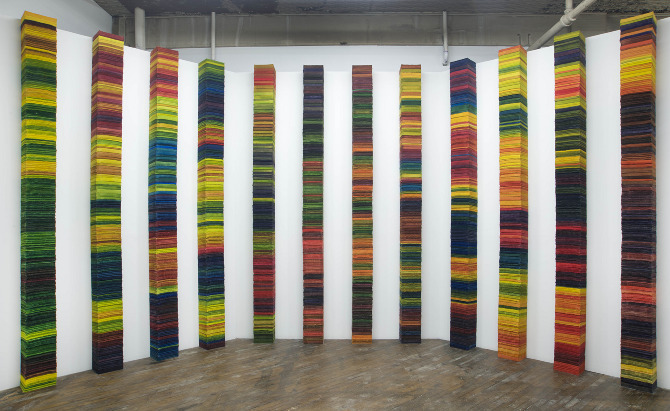 Each column is assigned a triad of colors, one complimentary pair and a third color equidistant between them. The triad is used to create a progression of 24 colors and this becomes the game board from which I select colors for the column. The colors are selected by rolling a pair of dice and moving a selector up and down the color spectrum. The moves are dictated by the game rules, which favor small movements, but allow for larger jumps too. Debtor’s Inheritance is a site-specific and interactive installation that was created as part of Greenmachine, a multi-media based exhibition on the grounds of the Schuylkill Center for Environmental Education in Philadelphia in 2007. The project was created in collaboration with P'unk Ave.
Another amazing work from Murken is a collaborative piece called Debtor’s Inheritance. Working with P’unk Ave, the work was displayed at the Schuylkill Center for Environmental Education in Philadelphia in 2007, as part of Greenmachine. 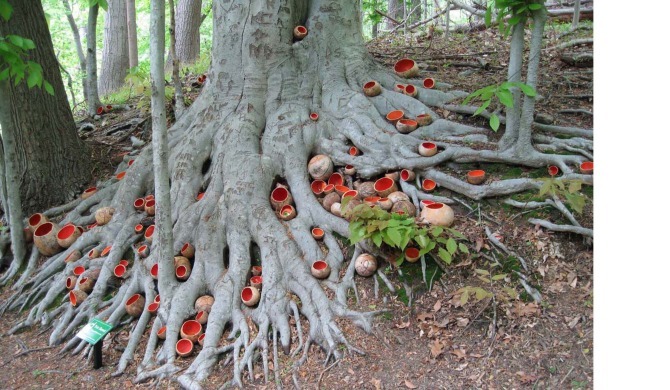 The exhibition experience involved viewers walking through the Schuylkill Center grounds where they found painted gourds with text message prompts. When the viewer sent a text message, s/he would receive a piece of the local history of the space. After walking through the space and sending several texts the viewer learned new historical pieces, layering with the previous pieces to create this bigger historical and ecological landscape. Through this history sent via text messages, the viewer becomes more aware of nature and the need to preserve natural spaces. Using new technology engages the viewer to interact with the work, aligning with how people respond to the world today. Murken also creates 2-D works with inkjet prints, spray-paint and chalk pastel, creating these manipulated, and yet awe-inspiring forest landscapes. One series is called Sunup Sundown, 2009, and features images of trees as flat, abstract forms, instead of organic and natural, as they actually exist in nature. In one image from the series, Murken alters the ground surface of the earth into this triangular/pyramidal form. From the earth, trees emerge, many sharply and vertically, with some of the trees’ horizontal branches removed. It actually appears as though Murken creates new trees by leaving some branches to connect to nearby tree trunks and (with paint and chalk) “erasing” those branches that distract from her composition. In Sunup Sundown, Murken adds deliberate swaths of color, whether they are earthy reds and blue-whites, oranges or purples. Freedom from Want and Need: I. Aspire, II. Acquire, III. Acquiesce, IV. Redeem, V. Reinvest. 2009.collaged digital inkjet prints with spraypaint and chalk pastel. 18" high x varying widths. A second series called Freedom from Want and Need, 2009, are works created in the same method as Sunup Sundown (inkjet paper, spray-paint & chalk pastel) but evoke an entirely different feel. Instead of just “erasing” portions of the print to create a new composition, Murken also plays with varying layers of transparency to create a fog-like feel that is both eerie and ethereal. Murken also plays with depth and space within the works, leaving some of the shadows of the trees in the frame to give a sense of weight. Yet, some of the trees appear ­flat, as Murken has removed any indication of shadow. Murken puts both of these ideas in the same piece which disallows the viewer to see the work as “a window into the world,” and rather as a two-dimensional representation of the world produced onto a two-dimensional surface. The level of thought in the process and means by which her work is created makes Murken an important contemporary artist to watch.